“Dipavali” and “Deepavali” redirect here. For the related Nepalese festival, see Tihar. For the films, see Deepavali (disambiguation). 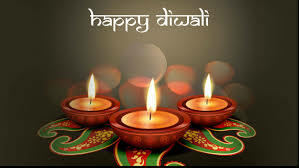 Diwali (Dipavali in Sanskrit, meaning “row of lamps”; also spelled Divali or Deepavali) is a Hindu festival of lights, which is celebrated every autumn in the northern hemisphere (spring in southern hemisphere). 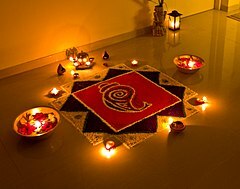 One of the most popular festivals of Hinduism, Diwali symbolises the spiritual “victory of light over darkness, good over evil and knowledge over ignorance.”During the celebration, temples, homes, shops and office buildings are brightly illuminated. The preparations, and rituals, for the festival typically last five days, with the climax occurring on the third day coinciding with the darkest night of the Hindu lunisolar month Kartika. In the Gregorian calendar, the festival generally falls between mid-October and mid-November. A kaleidoscopic array of lights was displayed at Guyana’s Hindu Dharmic Sabha Diwali motorcade, with thousands of Guyanese across the spectrum gathering to witness de spectacle. The motorcades displayed a blend of colours featuring religious depictions and music, all on moving vehicles, representing the various mandirs across Guyana. Participants traveled from as far as Essequibo and Berbice, for the motorcade, which took place last night. More than a dozen floats assembled at the Shri Krishna Mandir in Campbellville before moving along Campbell Avenue into Sandy Babb Street, into J.B. Singh Road, and along the Rupert Craig Highway to then make their way to the Chateau Margot ground East Coast Demerara. The streets were teeming with onlookers, as the floats were en route to their destination. When asked about the evolution of the annual event, one celebrant of the Goed Bananen Land Shirama Krishna mandir in Canje Berbice explained that the festival has become something that is ingrained in Guyana’s culture, with onlookers growing more diverse as the years go by. She then explained that her mandir’s float, which took three months to put together, was done with the help of mostly youths. The religious depictions on most of the floats incorporated a vast majority of young persons. The concept of Diwali motorcades commenced in 1974 after the Sabha’s President, the late Pandit Reepu Daman Persaud, thought that the festival of Diwali was too significant an occasion to be restricted to the lighting of diyas on Diwali night. However, while Diwali is popularly known as the ‘Festival of Lights’, the most significant spiritual meaning is “the awareness of the inner light”. 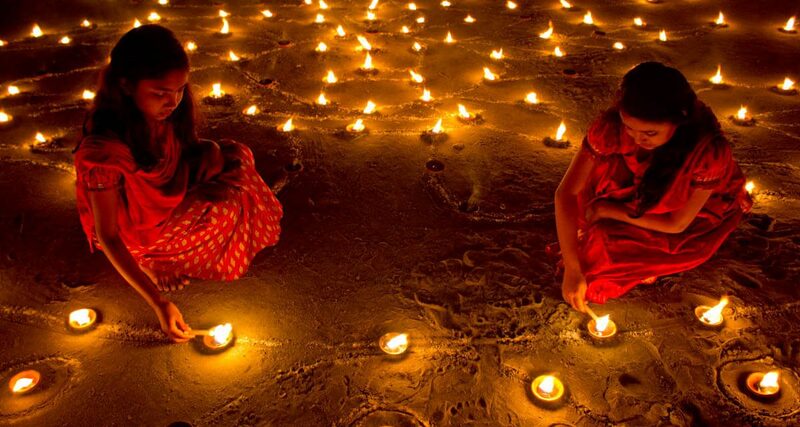 For Hindus, Diwali is one of the most important festivals of the year. The event is known to be celebrated by performing a mélange of traditional activities, with persons from across the religious and cultural spectrum participating as either spectators or participators in the festival. The event features festive fireworks, worship, sharing of sweets and lighting of diyas. The Festival of Diwali serves to refresh the spirit and creates the atmosphere for a happy and inspiring life. It ushers in the mood of reverence, removes feelings of despair, inspires high thinking and optimism, and strengthens the belief that evil and all its attendants will ultimately be conquered. 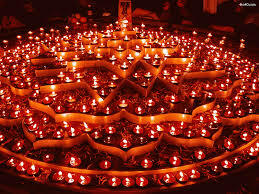 The principal theme of Diwali is the emergence from darkness to light.